“Eastern Old Books” exists to convey the charm of ancient Japanese woodprint, woodcut, and wordblock illustrations found inside antique books. The vecor images here are royalty-free and can be downloaded free of charge. 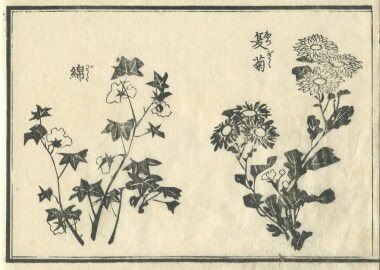 Please feel free to enjoy these Japanese woodblock illustrations. Each painstakingly created as far back as the Edo period more than 100 years ago, these antique prints possess an ineffable charm and attractiveness simply not found in today’s modern illustrations. To aid in your understanding of each print, we have included an English summary whenever possible. Besides being beautiful, these prints ensure that the long-ago customs, clothes, plants and animals of ancient Japan may live on through the web. To search the site, click the categories and titles to the left; if you cannot find what you are looking for, simply enter your query directly into the search box. All vector images on this site may be copied or downloaded absolutely free of charge. Please view and use them however you like—and help carry on the tradition! See all japanese wordblock illustrations in this site. Explore the charm of old Japan with hundreds of free vectors of Japanese woodblock prints. Detailed historical description included with each vector.